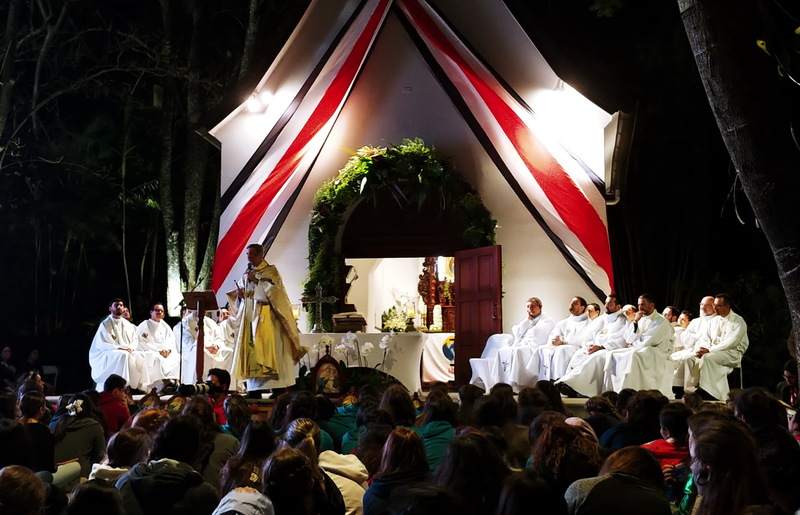 The Covenant of Love and its renewal united everyone the night of 18 January 2019, in Costa Rica’s “Family of Hope” Shrine— this included the more than 600 young people that had already participated in the International gatherings of the Boys’ and Girls’ Youth the previous day, those that had just arrived from Bolivia and Campanario, Chile, the Schoenstatt Family from Costa Rica and all those that were present for WYD tasks. 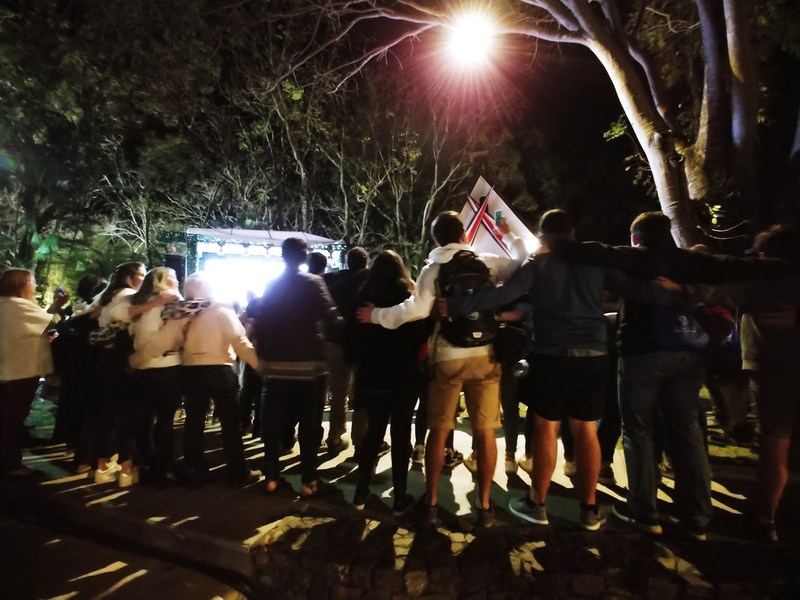 While the participants the Girls’ Youth “Hineni” gathering were “at home;” they only had to wait for the rest, the young guys from IGNIS had to navigate rush hour traffic on their return from Cartago, where they spent the day. 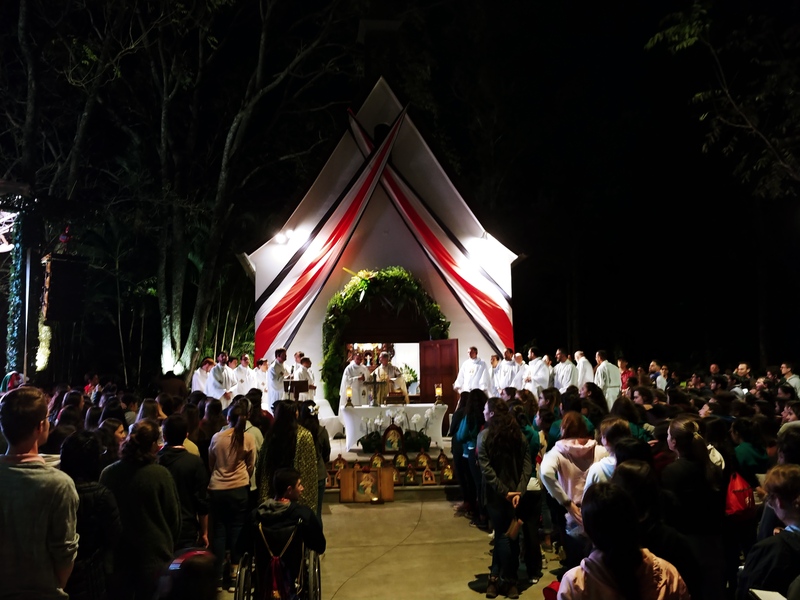 During the tropical evening, the time before Mass was marked by spontaneous singing, Covenant of Love celebrations in the shrine by youths from Germany, Brazil, and other countries, greetings, and exchanges. 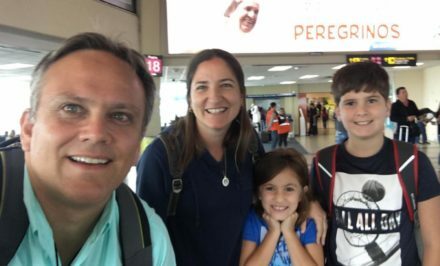 Marta, the only representative from Esquipulas, Guatemala related her experiences, and she shared her joy that in February a couple from Costa Rica will go to help to found the Movement in her country. At the beginning of the Mass, at Fr. 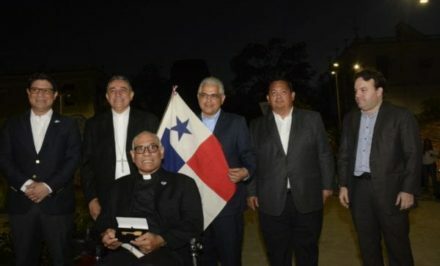 Alexandre Awi’s invitation, a large number of priests from different Schoenstatt communities – Schoenstatt Fathers, Institute of Diocesan Priests, and Diocesan Federation Priests, introduced themselves personally stating their country of origin, work, and their task. The lay advisers followed – Sisters of Mary, Frauen, Mr. and Mrs. Eduardo and Rosa Aymerich of the Institute of Families. There was a great deal of applause, gratitude, and a lot of curiosity was also satisfied. At the end, Fr. 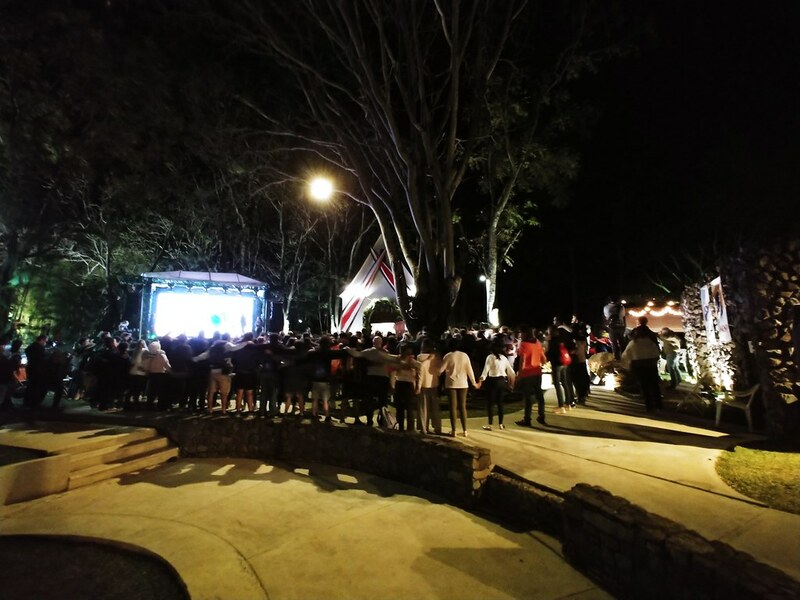 Alexandre affectionately called out the “adviser of the entire Schoenstatt Movement of Costa Rica” – the applause that followed even reached the kitchen, where a very professional team prepared the food for the youths. The Gospel that was chosen for the day was the healing of the paralytic. Fr. Alexandre explained that it was intentionally chosen since many times it is believed or felt that youths today are like the paralytic, who delay in deciding, in acting… By the way, that is not what has been experienced here during these days, but sometimes young people, and those that are not so young need to hear the Lord’s words “get up” to recall that God did not create us for comfort, rather he created us with a personal ideal and with a mission, and that nothing or no one, no physical, emotional, or moral difficulty should impede us from fulfilling our mission in life. Fr. Alexandre said, for this we need an encounter with Jesus. World Youth Day is or hopes to be an encounter with Jesus. 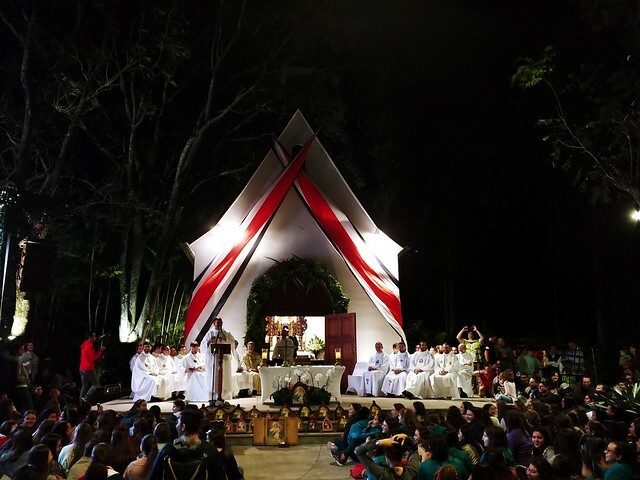 And now, what is the mission of the Schoenstatt Youth at WYD? At WYD with the motto that is Mary’s mission? Fr. 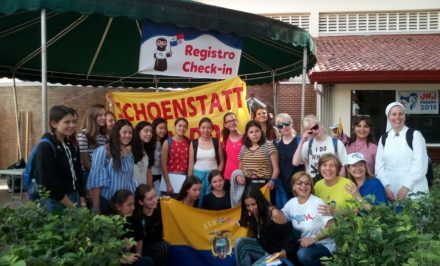 Alexandre clearly proposed it: That the Schoenstatt Youth help in this gathering so that many young people have an encounter with Jesus, with Mary, with the Blessed Mother. 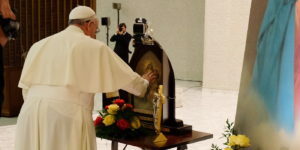 He asked the young people present: Do you want to be the Blessed Mother’s instruments at WYD? “Yes,” they shouted, softly at first, then loudly. Fr. 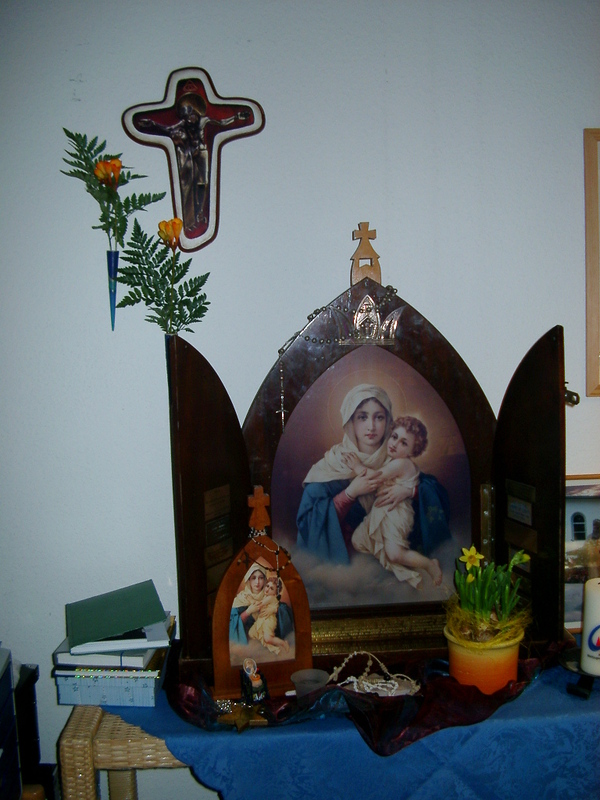 Alexandre said, “To be Mary’s instrument requires two moments: to be Mary for others and to take Mary to others. He explained it graphically with a hammer and a nail, showing that the hammer without the person falls to the ground immobilized, and a person without a hammer cannot drive a nail. At WYD2005 in Cologne, a large Pilgrim Mother, an Auxiliary, the International Auxiliary crowned as the Queen of the New Evangelization of America and the whole world, was present on the streets of Cologne and finally in the Pope’s box during the Vigil. 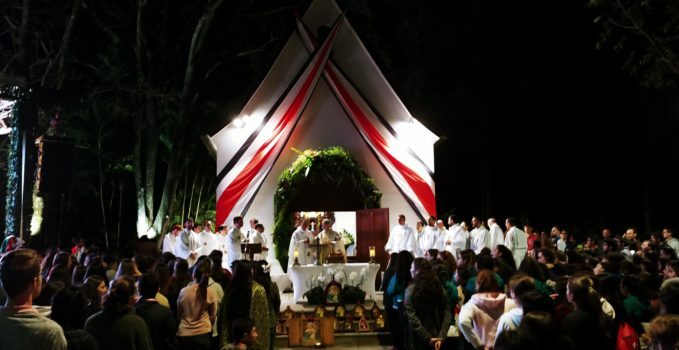 There were two instruments for this, a person who presented it, and the one who accepted it, and because of the things of God, both were present this covenant night at the Costa Rican shrine: Fr. 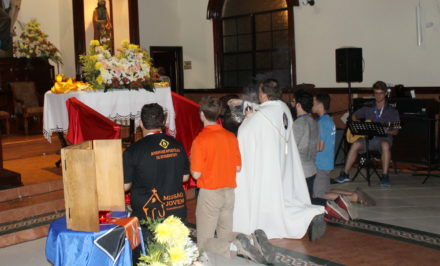 Alexandre, who accepted it, was the adviser of the Boys’ Youth from Brazil at that time; he related this experience to encourage the young people to be the Blessed Mother’s instruments. The picture was heavy, the youths asked themselves if the people from Cologne would think they were crazy, but what happened was that people paused, they asked, they asked to touch the picture, to take photos…In a word, new evangelization thanks to the courage of not hiding it, but instead, taking it to everyone. The story was so impressive that several people asked: Is there still a possibility of pursuing it for Panama? The youths and everyone present renewed their Covenant of Love by making a large human chain around the shrine. Afterwards total celebration – in lines for some delicious food, in dances, songs, encounters…And not only encounters among young people. The Covenant of Love always makes us allies.